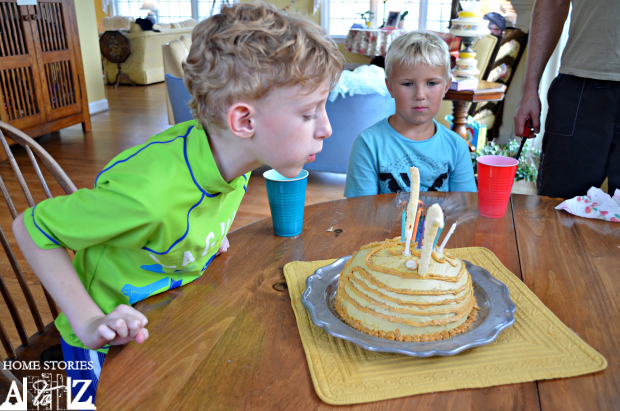 Every year my boys insist that we celebrate their birthdays at my mom’s house with all of their cousins. 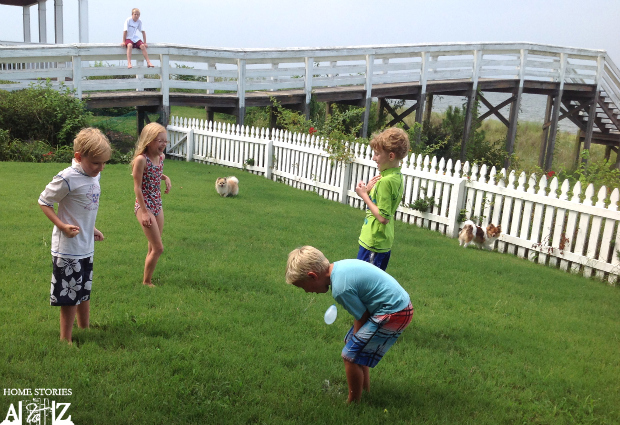 I am so incredibly grateful that my kids adore our extended family as much as I do! My 9 year old, Asher, has Asperger’s syndrome which seems to make friendships with kids his age a bit of a challenge. However, he has ALWAYS had easy social relationships with all of his dear cousins. 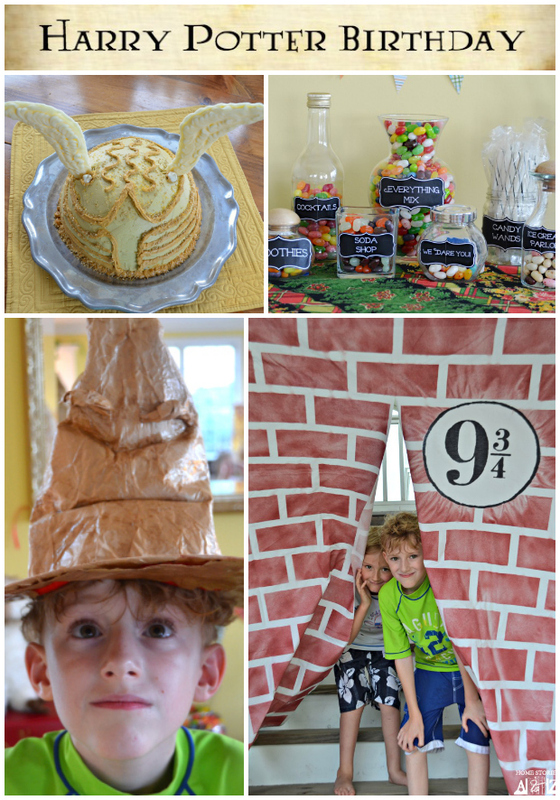 This summer, Asher has devoured several of the Harry Potter books and therefore requested a Harry Potter Birthday. Lucky for me, my little sister Christianne from the blog Little Page Turners threw an amazing adult Harry Potter Party several years ago and allowed me to use all of her awesome decorations from her party. Thanks Chrissy! What would a Hogwarts party be without the Platform 9 3/4? A sheet slit down the middle, taped off and spray painted in a brick pattern was hung on the walkway for guests to enter through as they arrived. My sister sewed the banners herself and used Harry Potter house graphics from legos to create the Harry Potter House iron-on graphics. My original plan was to set up tables outside under the house banners but an afternoon thunderstorm ruined our plans. They still looked cute in the gazebo for the short time before the storm arrived. 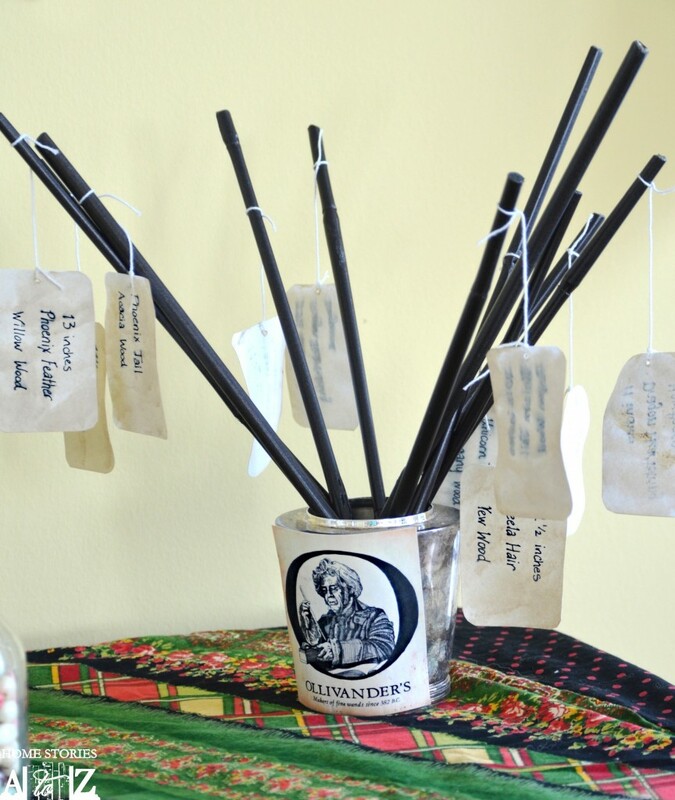 Wands were made from bamboo sticks cut and spray painted black. Hand-written signs on office tags hung from each wand. There may or may not have been a few squabbles over who got the wand made out of holly with a phoenix feather core! I love the look of candy buffets but not all of that candy! 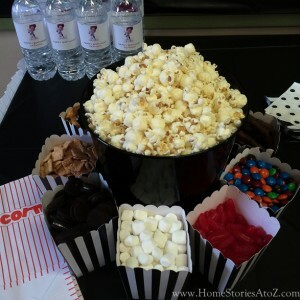 I kept our candy buffet very simple by just focusing on Bertie Botts Every Flavor Beans (jelly bellys in various flavors) and some candy wands. The kids LOVED the candy buffet and it kept them entertained trying all of the different flavors. At the end of the party I sent each kid home with their own bag of candy. 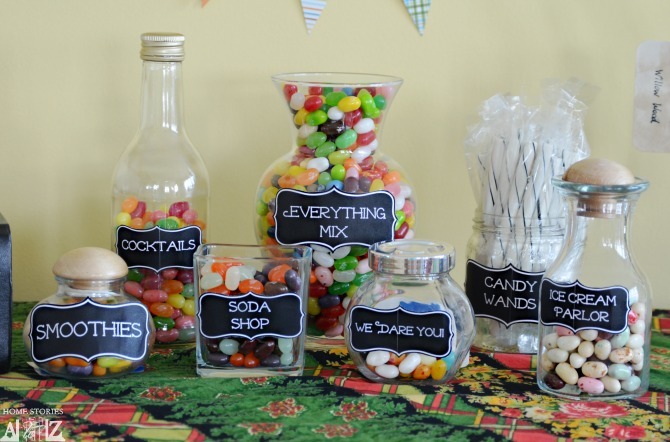 The “We Dare You” jar was filled with Jelly Belly Bean Boozled jelly beans and they were the hit of the party! The kids had a blast serving these disgusting jelly beans to the adults. You weren’t sure if you were getting “caramel corn” or “moldy cheese”. 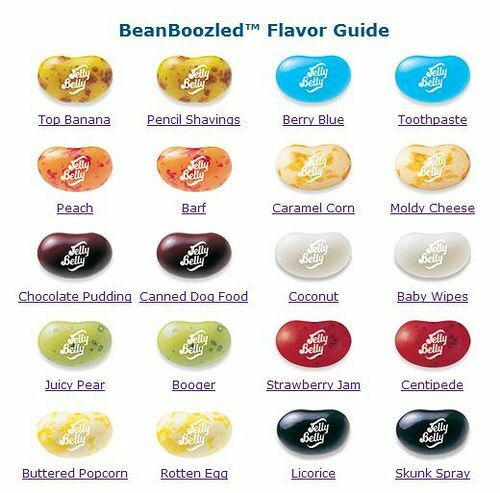 I was served gross flavors such as baby wipe, booger, and centipede. I spit them all out. 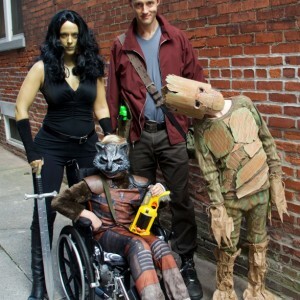 The kids were in hysterics over it and the adults were great sports :). 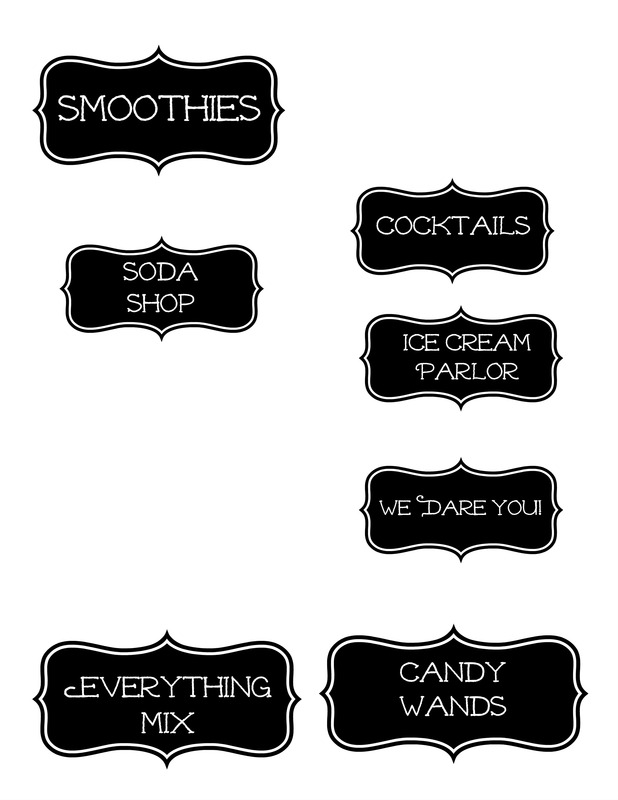 Here are my labels in case anyone would like them. Just right click on the file and save it to your computer to use. We had a crew of 16 to feed for dinner. I get really tired of typical cook-out fare. By this time in the summer I’ve had more hamburgers, hot dogs, and barbecue chicken then I can count on both hands. So I decided to mix things up by having a taco bar. I made ground beef and shrimp with the choice of either soft shell tortillas or hard shell taco shells. On the bar we had homemade guacamole, black beans, refried beans, spanish rice, peppers, lettuce, cheeses, tomatoes, sour cream, and chips. 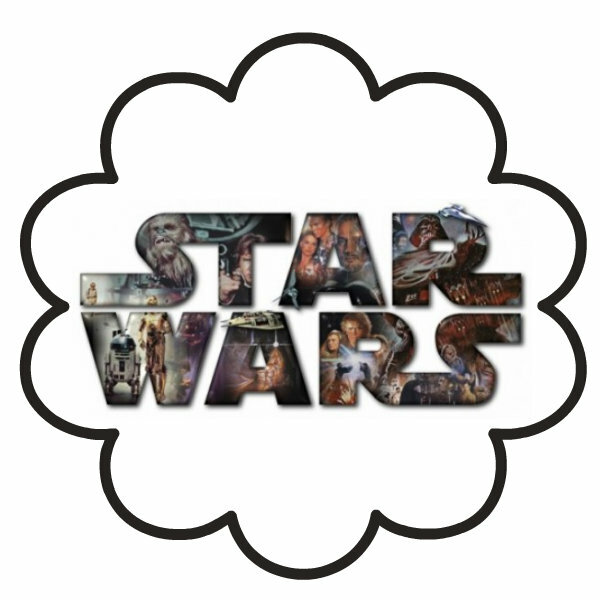 It was a huge hit with everyone and easy to throw together. 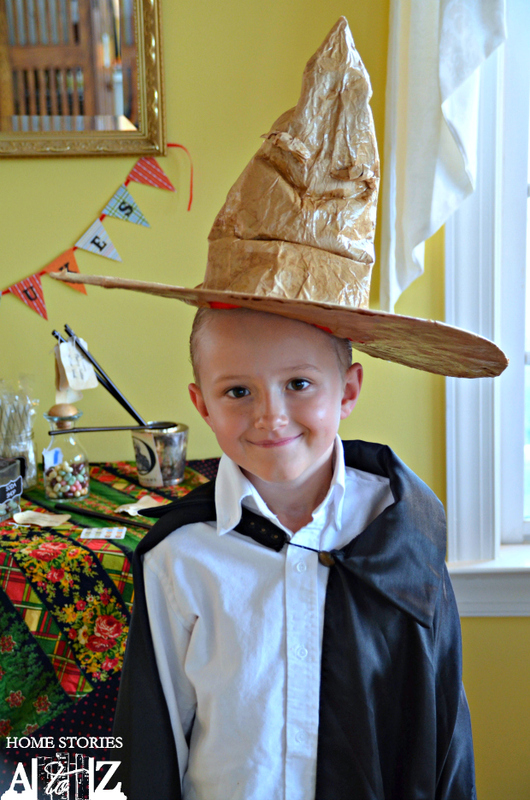 The sorting hat was made from a costume witch hat covered with brown paper lunch bags and Mod Podge. 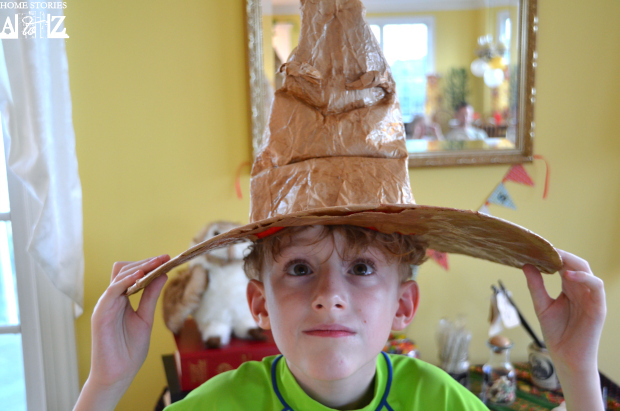 The face of the sorting hat was created by clipping office clips inside the hat to hold the creases in place until it dried. Eyebrows were made by balling up some paper bag and covering in Mod Podge. It was the cutest decoration and the kids had fun trying it on to see which house they were placed in. 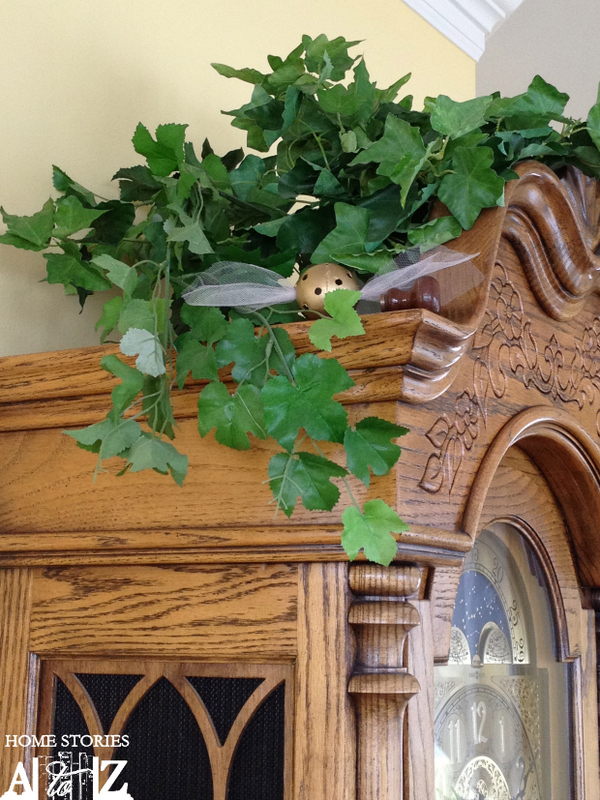 My little Draco Malfoy was of course placed in Sytherin House. Asher was hoping for Gryffindor! 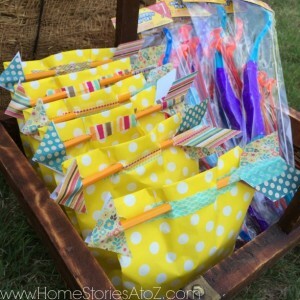 We had very simple games for the party and the kids loved them all. 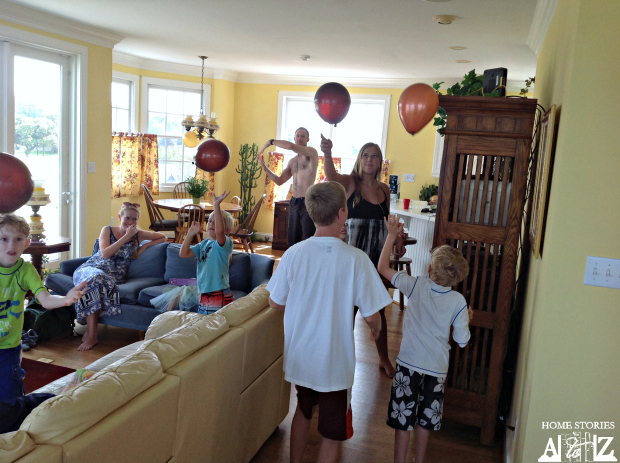 We started off with our own version of Balloon Quidditch. We broke the kids into two teams and one team tried to get the “quaffle” (orange balloon) through the “goal post” (Matt’s arms) while the other team tried to hit the quaffle with their “bludgers” (red balloons). If the “quaffle” fell to the ground it was automatically the other teams turn. If the team managed to get their “quaffle” through the goal they scored a point. The next game was “Find the Snitch”. A wiffle ball spray painted gold with a piece of tule stuck through it was hidden in the house and the kids then had to find it. They all squealed with delight when they spotted the snitch! Next, we moved outside for the “Potions Class”. This was just a water balloon toss and if the “potion” spattered on you, then you turned into a frog if it was a green ballon, a monkey if it was an orange balloon, etc. The final game was “Defense of the Dark Arts”. Each child chose a wand and had to cast a spell on a bubble (pop it with their wand). 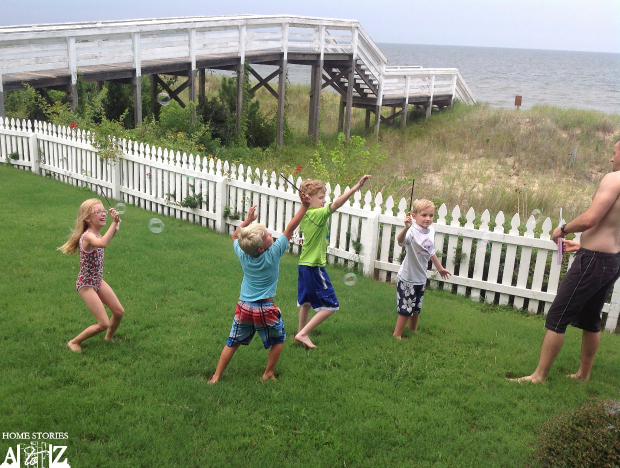 Whoever popped the most bubbles with their wand won! Pippin my pomeranian puppy might have won this one. He had a blast chasing down all of those bubbles :). I am known in my family for making remarkable cakes for my boys’ birthdays. But this year I really didn’t want to be up until 3am decorating a cake! 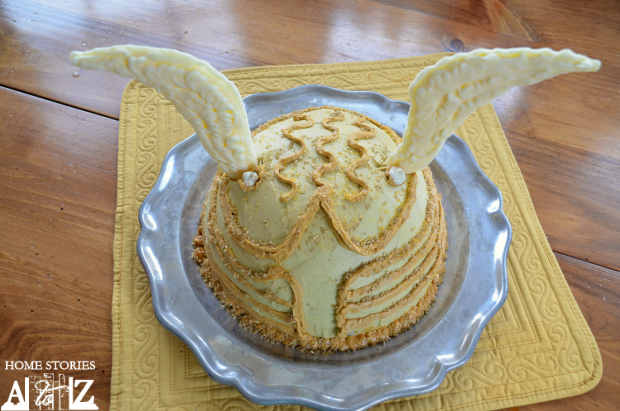 I made things easy on myself by making a Golden Snitch Cake. I used a Betty Crocker Bake N Fill Cake Pan to create the ball shape cake. I made the outside of the cake with Betty Crocker Gluten Free Devil’s Food Cake Mix and added white chocolate chips to the mix. For the inside, I used Betty Crocker Gluten Free Yellow Cake Mix and added dark chocolate chips to the mix. Betty Crocker Gluten Free mixes are the best g/f mixes I’ve found. The cake is dense and not at all gritty like some g/f cake mixes. No one even knew it was gluten free until I told them. 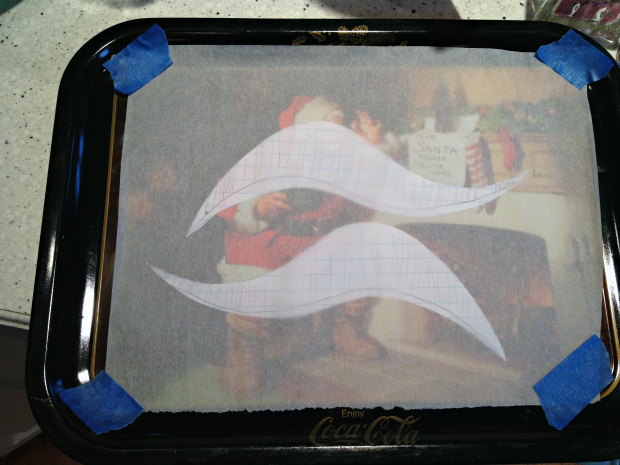 For the wings, I created a wing template, cut them out, and placed them on a metal tray covered in parchment paper. I melted white chocolate, stuck it in a plastic bag, snipped the end and piped it onto my wing pattern. I stuck the chocolate wings in the freezer until I served the cake. It was a hot day so I didn’t want to take any chances on the wings melting. The frosting on the cake is homemade butter cream frosting. It’s my favorite recipe and is so easy to make. Just mix two sticks of butter, 3 cups of powdered sugar, and 1 1/2 T of heavy whipping cream together on medium for 2 1/2 minutes or so. To make the gold color I mixed 8 drops of yellow food coloring, 1 drop of red, and 1 drop of green. I doubled it for the piped on gold decoration. I also used some gold sprinkles on the cake to give it a little glam. The birthday boy seemed very pleased with his snitch cake and all of the kids enjoyed munching on a piece of chocolate wing along with their cake. 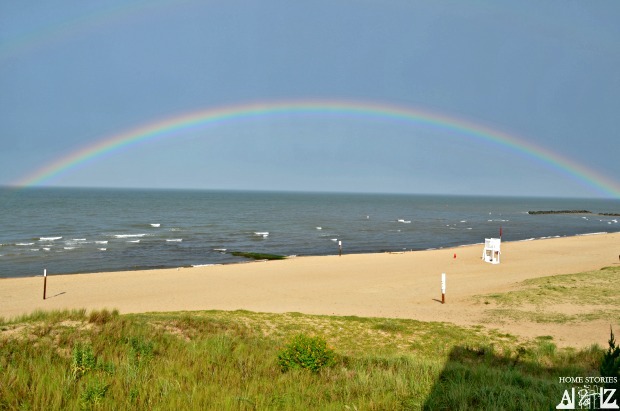 Even though the rain altered our plans a bit it had a silver lining—or actually a rainbow lining! 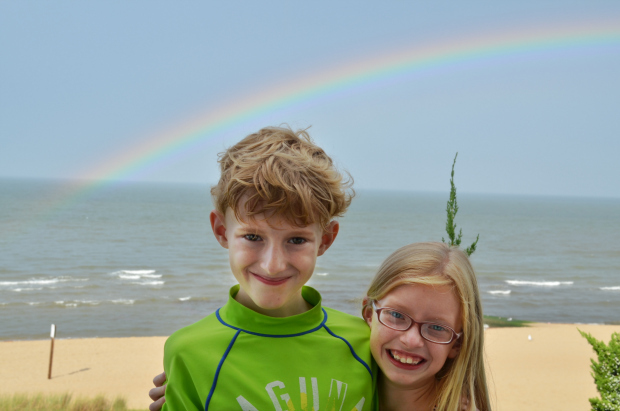 Asher has been blessed with a gorgeous rainbow on his birthday celebration several times over the years. He declared, “It’s God’s way of blessing me!” I believe it is my sweet boy. My birthday parties are never over-the-top crazy but are doable by anyone which is why I share them with all of you. 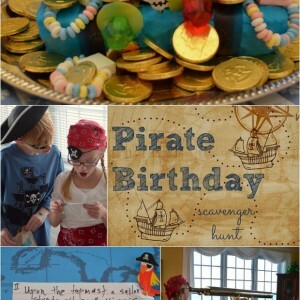 In case you want to pin these ideas for your next party, feel free to use the pinnable collage below! Thanks for stopping by :). Oooh, I’d love to attend this party. My son has been Harry Potter for Halloween for 3 years in a row! We love all things Harry! Awww so cute! 🙂 Love the Harry Potter theme, so many cool ideas and decor. Happy Birthday little one! I am SO in love with the sorting hat!! My son is a HP fanatic and would love this!! The cake is fantastic, as well! Great job! Love this! As a Harry Potter geek this is amazing! Ha! No. My little sister made some for her party though :). What an amazing party! 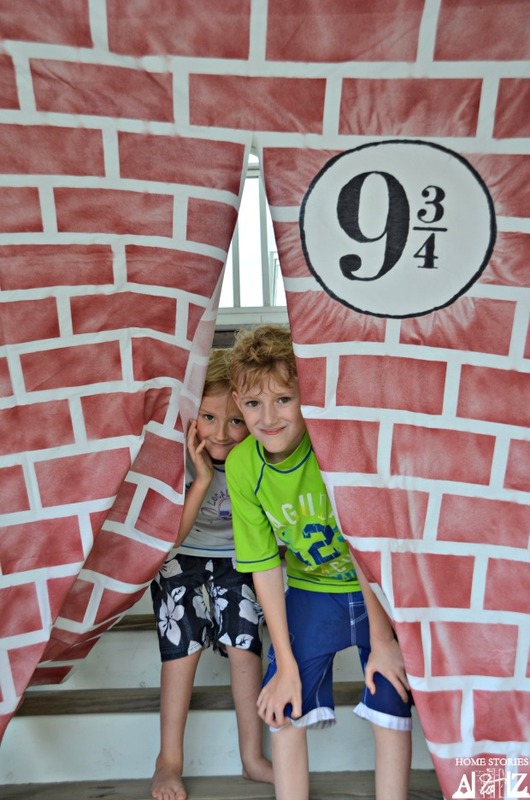 My son went to Harry Potter summer camp, and is making his way through the books now so I have a feeling a Harry Potter birthday will soon be requested. This is going to be a huge help!! That sheet is brilliant! Oh wow. My kiddo would LOVE to go to Harry Potter summer camp. I didn’t even know there was such a thing. Thanks so much Sara! 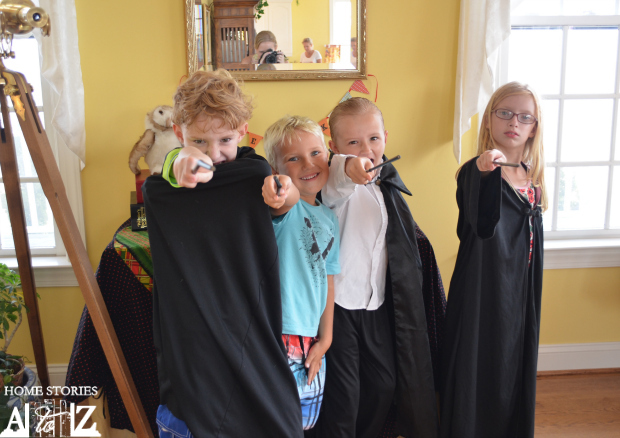 It is fun to finally share the joy of Hogwarts with the boys. As a Harry Potter nerd for life… 😉 I loooove this!! I definitely had a Harry Potter birthday party myself when I was way too old, something like 16… it was before blogs and Pinterest, though, so there wasn’t much inspiration online. We tried to make butterbeer and chocolate frogs and things, but didn’t have much inspiration for the decor. Looooooove those house flags you made!!! And yay GF birthday cakes. =) Gluten free is the best.